Former Queens Parks Commissioner Estelle Cooper passed away over the weekend, according to Sinai Chapels in Fresh Meadows. 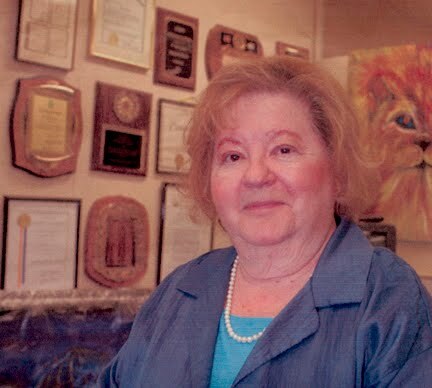 The 82-year-old Whitestone resident, who was indicted in July on grand larceny charges for allegedly stealing over $50,000 from a nonprofit conservancy group she helped start, was facing up to 15 years in prison if she had been tried and convicted. 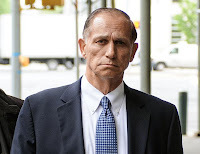 Here’s to Pedro Espada Jr. of the Bronx (or maybe Westchester), who used to insist that corruption charges against him amounted to a satanic plot. Let’s give a cheer to Hiram Monserrate of Queens, another state senator who helped make Albany synonymous with dysfunction. Yet another state senator, Shirley L. Huntley of Queens, called a new conference in August to announce not that she had a bill to propose but, rather, that she was about to be indicted on corruption charges. Jimmy K. Meng, once a Queens assemblyman, admitted in court last month that he’d solicited $80,000 to help a friend get off lightly in a criminal case. 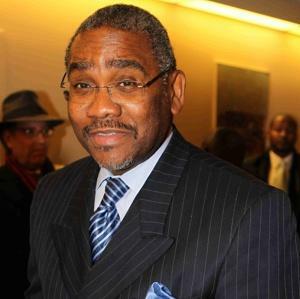 Let’s hear it for Larry B. Seabrook, a Bronx city councilman convicted in July of orchestrating a corruption scheme. And for Assemblyman Vito J. Lopez of Brooklyn — Gropez in New York Post headlines — who is under criminal investigation for alleged sexual harassment. Drivers who use the Whitestone Expressway should prepare to make an adjustment to their driving pattern in the New Year. 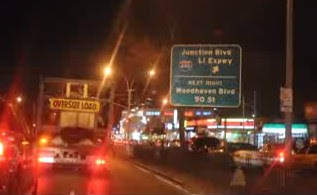 The Whitestone Expressway’s 3rd Avenue exit will be closed to all traffic starting on Jan. 7 for approximately two years. 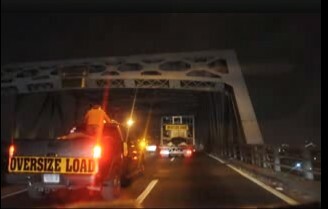 The closure is part of the Metropolitan Transportation Authority Bridges and Tunnels’ Capital Improvement Project. The 42-month, $109 million reconstruction will transform the 1,010-foot-long Queens approach to the bridge, rebuilding the roadway and adding new emergency breakdown shoulders. The southbound 14th Avenue exit ramp will be repaved as well as gaining a deceleration lane and new curbing. Passenger vehicles driving from the Bronx-bound Cross Island Parkway will have to exit at Utopia Parkway (Exit 33N), and those driving from the northbound Whitestone Expressway will get off either at the 20th Avenue exit and or merge onto the Cross Island Parkway. 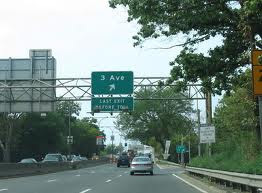 All commercial vehicles must exit the Whitestone Expressway at 20th Avenue (Exit 15). 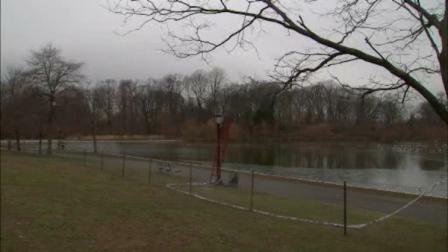 An investigation is underway after a woman's body was found Saturday morning in a lake in Flushing, Queens. At about 7:45 a.m., police responded to the vicinity of 164th Street and Booth Memorial Avenue. Upon arrival, officers found a 63-year old woman unconscious and unresponsive in Kissena Lake. EMS responded and pronounced the woman dead at the scene. So far, police do not suspect any criminality. For as long as I can remember, the 7 train has shut down on winter weekends for repairs. I know, because I used to work weekends in Manhattan and had to deal with this very inconvenience. The suggestion that the work could or should be completed by shutting the line down for one week straight is kinda dumb as well as impossible. And the assertion that the MTA needs to take the Lunar New Year celebration in Flushing into account is also lame. The trains are still going to Flushing, it just requires a transfer at Queensboro Plaza to get there. If you opened a business in LIC thinking winter weekends were going to be some kind of cash cow for you, you should have done your homework. Keep in mind that the Rockaways currently do not have direct train service anywhere. Maybe this is the right time to count one's blessings as we head into a new year instead of throwing temper tantrums in front of TV cameras. Here comes the property tax hike! 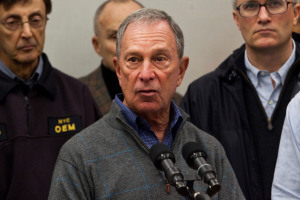 The City Council would have to raise property taxes to fund retroactive pay increases for municipal workers — and that’s going to happen, Mayor Bloomberg said yesterday. 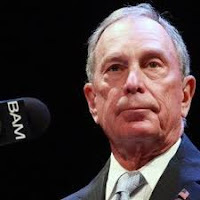 The mayor was reacting to a report by the Independent Budget Office that said the next mayor could be facing a tab of more than $5.4 billion if unsettled union contracts are negotiated after Bloomberg leaves and include retroactive pay hikes. 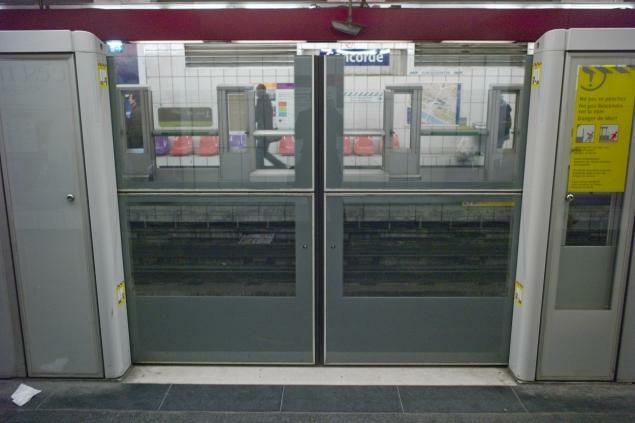 “We have to revisit it,” interim MTA Executive Director Thomas Prendergast said Friday of a pilot project to install sliding doors on the tracks. It would be nice if the mayor put the DOH's anti-soda and anti-salt money toward something like this which would actually protect the public. A new report finds New York City paid out more than $686 million during the last fiscal year in settlements and court awards. The disputes ranged from slip-and-falls to contract disputes to lawsuits against police. City Comptroller John Liu‘s report Thursday says the total is down very slightly from the previous fiscal year. But he notes that costs are rising in the areas that account for more than three-quarters of the payments: personal injury and property damage. The city paid out more than $550 million in those areas in fiscal 2011, up more than 5 percent in a year. That includes three consistently expensive areas: claims against police, city hospitals and the city Transportation Department. The totals include both lawsuits and matters handled through a city claims process. 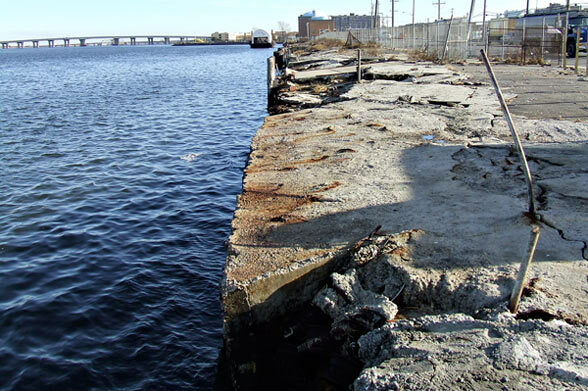 The bay wall that runs along a large portion of Beach Channel Drive, a main thoroughfare in the Rockaways, has sparked the concern of local politicians and community leaders. The area’s state assemblyman, Phil Goldfeder (D-Ozone Park), said he has long called for the restoration of the bay wall and pointed out that it now is in even worse shape after Hurricane Sandy. “Right now, the safety of Beach Channel Drive is questionable and this puts our families at a level of risk that I refuse to accept,” said Goldfeder. Community Board 14 District Manager Jonathan Gaska also said the community has long been struggling to bring attention to the wall. “We have been fighting for years and it’s about time someone takes notice before it’s too late,” he said. The seawall includes both public and private ownership. But the city Department of Transportation said for the portions under its jurisdiction, repairs have either been completed or are about to begin. The agency said it has already wrapped repairs at Beach 131st Street and it expects to soon begin repairs from Beach 116th to Beach 125th streets and from Beach 130th to Beach 145th streets. 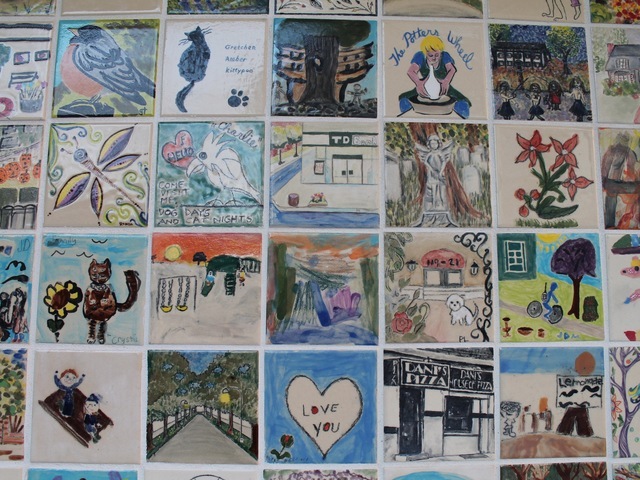 Kew Gardens residents are showing neighborhood pride by making tiny works of art on 4.5-by-4.5-inch tiles. The tiles will be fit into a mural they hope will one day be installed in Forest Park. 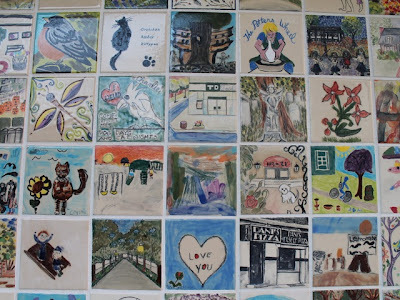 So far, roughly 70 locals have contributed personal paintings — among them a tile featuring Forest Park's famed “crooked tree,” and others showing birds, cats and even local pizzerias. One tile shows an intersection with signs pointing to Long Island, the Bronx, Manhattan and the Rockaways. Last year, the studio conducted a similar project around the theme of family and community that was also made into a mural. The studio, which has received a grant for the project from the Citizens Committee for NYC, a non-profit organization aiming to help New Yorkers improve the quality of life in their neighborhoods, is hoping to install the mural soon after all the tiles are finished. A spokesman for the NYC Parks Department said in an e-mail that the agency has received the proposal and is evaluating it. John Quintana’s three cars parked in front of his Coney Island home were destroyed by Superstorm Sandy. But like thousands of other New Yorkers the veteran sanitation worker was hit with hundreds in extra registration fees by the state’s Department of Motor Vehicle's office to complete the paperwork for his new vehicles. Now, a local state pol is urging the Cuomo administration to waive those added costs for Sandy victims. “The state has an obligation to do everything we can to help these families who have suffered so much,” said state Assemblyman William Colton (D- Bensonhurst). 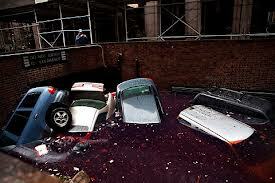 An estimated 200,000 vehicles citywide were ruined by Sandy's salt water surge, Colton said. As a result, Cuomo announced a plan to eliminate dozens of bureaucratic charges for various state services, including waiving the $28 DMV fee for replacement registration documents. But that did little to help Quintana, 59, who was forced to fork over nearly $800 in registration fees and to cover costs to transfer his old license plates to his three new cars. Forest Hills has lost its favorite pet to an upstate farm animal sanctuary. 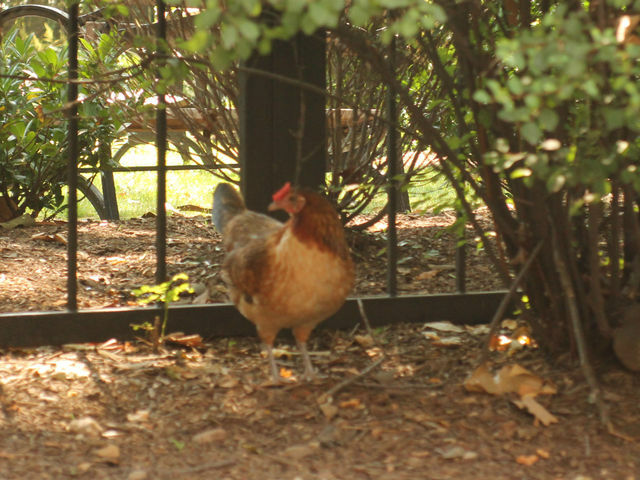 Queeny, a tiny hen named after the borough where she was found, made headlines this summer after running loose on the streets around Station Square. Queeny is a small Araucana chicken, according to Andernach. He said the hen is not afraid of big roosters that also reside in the sanctuary. In fact, he said, Queeny seems to have tamed a group of roosters that he calls the Frat Boys, who were rescued from a crystal meth lab. Queeny was taken upstate just before Hurricane Sandy hit. Park Enforcement Police and NYPD and have made multiple arrests for people stealing material from the the Rockaway beach boardwalk destroyed by Hurricane Sandy, NYC Park Advocates has learned. As aluminum prices continue to rise at least ten thieves have been caught stealing aluminum railings and expensive rain forest Ipe boardwalk wood belonging to the Parks Department. Police in the 100th Pct. have also written at least a dozen summonses for people stealing items on the street to be sold as scrap metal. Community Board 11 has received an application for the construction of a retail and community facility at the Scobee Diner site in Little Neck, the board’s district manager said. The building on Northern Boulevard that previously housed the popular diner has been vacant since the eatery closed in November 2010. Susan Seinfeld, CB 11’s district manager, said the board has received an application from Manhattan’s LION BEE Equities to demolish the Scobee building and replace it with two-story building with retail on its first floor and a community facility on the second floor. Seinfeld said it was unclear what type of retail store the developer was planning for the first floor. A community facility for the second floor could be anything from a day care center to a medical office. The applicant would need to go to the city’s Board of Standards and Appeals for a variance because the Scobee property is split up between three different zoning districts. Chain stores in Queens grew at half the rate of last year, a report released Monday showed, though their effect on the borough is not always positive, according to business experts. 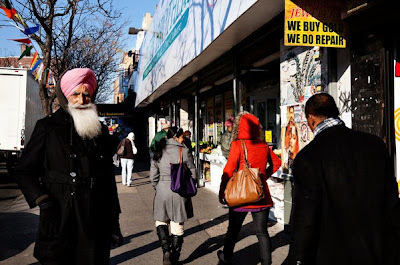 “State of the Chains 2012” is an annual report published by the Center for an Urban Future, a Manhattan-based nonprofit, and showed that the city as a whole added 2.4 percent more chain stores this year, while the stores in Queens grew at a slower rate of 2.1 percent. Seth Bornstein, executive director of the Queens Economic Development Corporation, said chains can add a value to the business landscape of the borough, but having too many of them can create a drag on the economy. 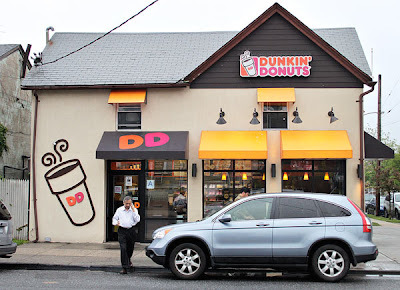 Queens boasts the second-highest number of chain stores in the city — Dunkin’ Donuts has set up more franchises in the borough than in any other — but this year ranked behind the Bronx, Manhattan and Brooklyn in its growth rate. State Island actually lost chain stores over the last year. The growth rate in Queens is about half of what it was in 2010 and 2011, when the borough saw a 5.4 percent increase in chains. Heading into 2012, Queens had 1,624 of the businesses, with Dunkin’ Donuts and Subway leading the way. By the end of the year, 34 more stores had opened up shop. “An overabundance of chain stores can attack an area’s retail fabric, usually by causing rent increases that make it impossible for small, independent businesses to thrive. This can lead to fewer unique services and products and really change a neighborhood’s character,” [Bornstein] said. 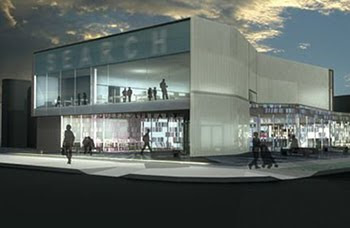 Sometime in the spring, a glamorous new branch library will open in the unlikeliest of places, at 255-01 Union Turnpike in Glen Oaks, Queens. Designed by Scott Marble and Karen Fairbanks, who founded Marble Fairbanks in 1990, this blast of neo-mod zazz will rise in the midst of what is akin to a strip mall. Replacing an older brick-faced structure on the same site, the new library will be an 18,000-square-foot, LEED certified space on three levels — one of them below grade — that will contain a circulating library, a cyber center and communal meeting spaces. Weren't we threatening to close Queens Library branches recently due to lack of funding? Why is a glamorous new hoidy-toidy branch being built in Glen Oaks? 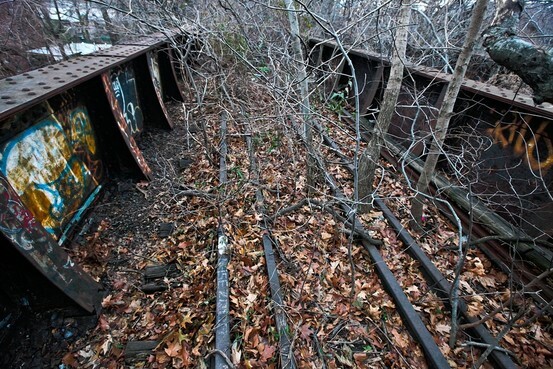 The effort to remake a 3½-mile stretch of abandoned railway tracks into the Queens answer to the High Line took a step forward this week as the state put up about a half-million dollars to study the project. But the Queensway plan favored by park advocates and local groups faces significant hurdles: Is the site contaminated? Can elevated tracks abandoned for 50 years still support walkers and cyclists? Will a project stretching from Rego Park to Ozone Park attract the Chelsea-size checks that helped bring the High Line to life? The proposal for an elevated park paired with bike trails, fitness zones and ethnic-food stalls got its first nod from the state when New York Gov. Andrew Cuomo on Wednesday gave the Trust for Public Land a $467,000 grant to study the project. "That is the first step toward making the Queensway a reality," said Christopher Kay, chief operating officer of the Trust, the nonprofit group helping spearhead the new park. But even if the elevated tracks turn out to be free from environmental or structural issues, huge challenges would remain as nonprofit backers work to clean and revitalize a site that has suffered from a half-century of neglect. In its current incarnation, the Queensway features "a great representation of cultural diversity from the beer cans that you find," said Marc Matsil, a local official with the Trust. I thought the state was broke. The governor all of a sudden has money to piss away on a feasibility study for something we all know isn't feasible? With this money, the acquisition of the Brinckerhoff Cemetery could have been funded 4 times over. Beer cans as a reflection of Queens diversity...gotta love it. So the NY Times’ Metro desk is supposed to cover Queens, but they have it in their travel section. OMG, everything is so exotic and ethnic there! 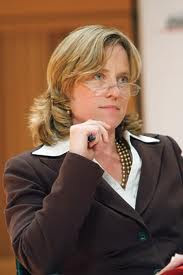 In an effort to reintroduce herself to Queens, former Councilmember and Assemblymember Melinda Katz has been making her way around, preparing to run for the borough president nomination in a crowded Democratic primary field. Katz served in the Assembly from 1994 to 1999. 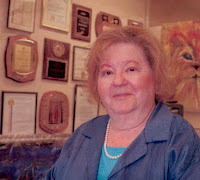 From there, she oversaw all the community boards in Queens when she worked under former Borough President Claire Schulman for three years. 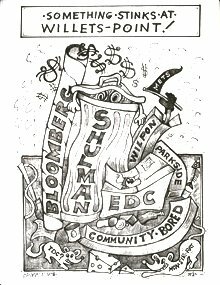 Going back to the community boards nearly 20 years later, Katz has run into some familiar faces and reminiscing on some of the work done for the borough during that time. “It’s nice to see that when you leave elected office and come back that people welcome you,” she said. 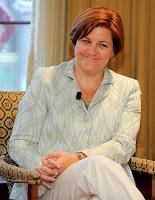 Katz left politics in 2009 after she was term limited out of City Hall. She subsequently lost a bid for City Comptroller to incumbent and fellow Queens native John Liu. Between leaving office and announcing her candidacy in November, she worked for Manhattan law firm Greenberg Traurig, where she specialized in government issues and land use. Yeah, see, if you really cared about the welfare of Queens residents, you would have stayed involved civically instead of just crawling out from under a rock to make the rounds once you decided to run for another office. 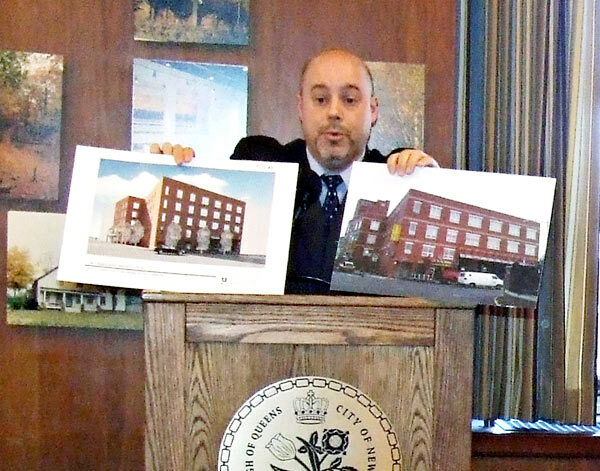 In a year’s time some of the buildings on 82nd Street between Roosevelt and 37th avenues will be restored to their historical prime, 82nd Street Partnership Executive Director Seth Taylor said this week. “The block has some best examples of Neo-Tudor style in the city,” Taylor said, referring to the street’s peaked roofs and grided stone, wood and stucco facades. 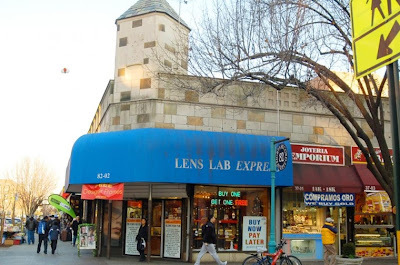 According to the Landmarks Preservation Commission, the tenants and business owners on 82nd Street are one of the least compliant in the city with historical district rules. The block has about 52 outstanding violations, LPC spokeswoman Lisi de Bourbon said. To incentivize those businesses the 82nd Street Partnership was awarded a $50,000 Storefront Improvement Program grant by the city’s Department of Small Business Services. The money will allow the partnership to work with between five and seven store owners on the block, Taylor said. Phase one will be to create a design that eliminates their LPC violations, and will be paid for in full by the grant. 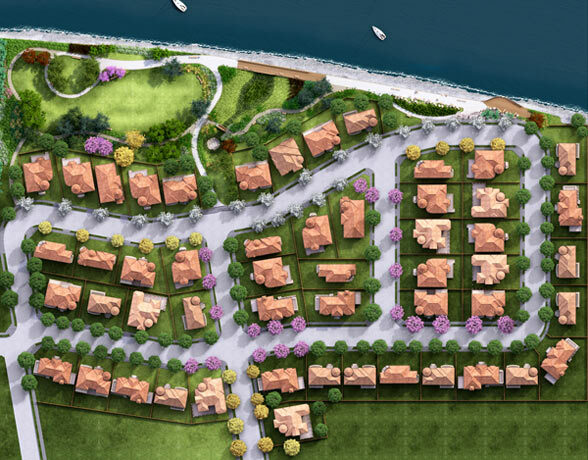 Phase two implements the plan, in keeping with the neighborhood’s architectural style. Owners will split the cost of construction with the 82nd Street Partnership. Taylor estimates each project will cost about $5,000 in total and take about two months from start to finish. Even before Hurricane Sandy, Glen Oaks Village President Bob Friedrich said his group maintained a running list of ailing trees in his part of northeast Queens, but to no avail. According to Friedrich, the Glen Oaks tree-trimming laundry list went virtually unnoticed when presented to the city Parks Department despite warnings about roughly 50 unhealthy trees. By the time Superstorm Sandy swept through his streets, Friedrich said almost half of the already problematic trees had toppled down from the intense wind and rain. In front of uprooted sidewalk plots where trees once stood and homes with missing roof shingles, state Sen. Tony Avella (D-Bayside) joined civic leaders and homeowners in Floral Park last Thursday to blast the Parks Department for neglecting homeowners’ requests and failing to maintain its trees. Avella said a changing climate has forced the city’s hand in committing to new policies involving tree damage, stump removal and the placement of new trees. The senator had held a news conference on the subject in July 2011 and said things have not gotten any better this year. To expedite progress, Avella said he developed his own plan, which included calling on the formation of a tree policy review committee to evaluate tree maintenance and to put an immediate temporary halt to the city’s Million Tree Planting program until new rules and procedures are installed. Avella said the city was rushing to fulfill its million trees commitment without proper planning, which has resulted in trees being planted in inappropriate or poor locations. 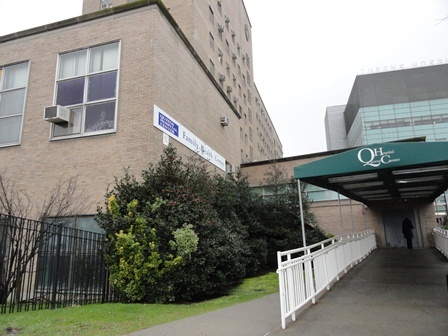 Community Board 1 in Astoria recommended the Board of Standards and Appeals allow developers to continue work on a medical facility, which its neighbors say is causing their homes to crumble. The eight-story building’s backyard at 23-25 31 St. must be rezoned to allow 30 feet of space from the property line instead of the usual 20, before construction can continue. The Department of Buildings issued a stop-work order in late summer. The structure being developed by Pali Realty had 13 violations and $16,000 in fines. 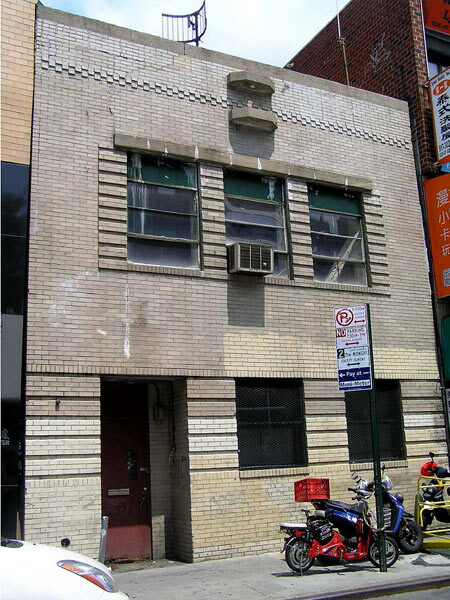 The building now has one violation, according to CB 1. The board voted for the change, given four stipulations, with 17 members for the variance, nine against and one abstention, which pleased the majority of the 50 individuals in attendance at Tuesday’s meeting. “Get your lawyers,” board member Frances Luhmann-McDonald said, who voted against the variance. The homeowners whose backyards abut the large facility had hoped for a different result. Nevertheless, they say it won’t change much for now. “We had a house and we want a house,” 32nd Street resident Robert Draghi said. He claimed the building workers would push out the downstairs windows to climb into the Draghis’ yard, without permission, during construction. But now that the building is further along workers can’t climb out the windows because of the way they are installed. Draghis also plans to keep his gate locked. “They can’t finish the building. It’s not going to happen,” he said, reiterating that without access to his yard, the construction will be stalled. According to engineer Neil Schmelkin, who conducted a private assessment of Draghi’s house on July 24, it would be more cost affective to rebuild the 60-year-old brick home from scratch rather than repair all major and minor cracks in the foundation, drywall and brickwork. The Indian Cultural and Community Center has revamped plans for building senior housing on the campus of the Creedmoor Psychiatric Center. The project has been embroiled in controversy since it was first proposed. Now that the group wants to add an extra 17 apartments to the mix has civic leaders and at least one elected official furious. The ICCC owns approximately 4.5 acres at Creedmoor, located at 79-25 Winchester Blvd., in Queens Village and wants to build a community center and senior housing. Originally they were seeking to construct two nine-story buildings, with 126 apartments. Now it’s asking to place 143 apartments into the same size towers. Both the state attorney general and inspector general are investigating the deal to determine if there was any inappropriate or criminal behavior on the part of the group and both current and former elected officials. The ICCC has also recently petitioned the Board of Standards and Appeals for a waiver because the project does not have frontage on a mapped city street. The city is making a new effort to channel mentally ill people who get arrested into treatment instead of jail, if they don’t need to be there, Mayor Michael Bloomberg announced Sunday. 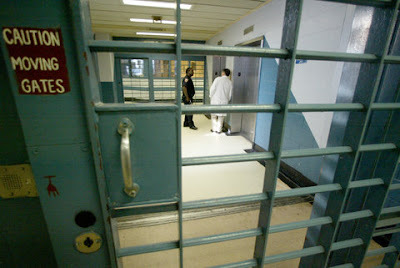 Citing statistics showing that people with mental health problems tend to spend extended time behind bars for lack of bail money, officials said they aimed to do better at assessing defendants’ psychiatric needs and meeting them in the least restrictive setting that’s appropriate. Courts and jails in New York and around the country have grappled for years with how to handle growing numbers of mentally ill defendants. The federal Bureau of Justice Statistics estimated in 2006 that more than 1.2 million adults - or more than half of all inmates - were in state and federal prisons and local jails. In New York City, some 36 percent of jail inmates have some level of mental illness, compared with less than 25 percent in 2005, officials said. And the average mentally ill inmate is behind bars for about twice as long as are other inmates facing comparable charges and bail, as those with psychiatric problems tend to have less ability to post bail, officials said. Meanwhile, the city spends about three times as much supervising and caring for a seriously mentally ill inmate as it costs to house an inmate without psychiatric problems, officials said. The new initiative will start next year and set out to work with 3,000 people annually, Bloomberg said. 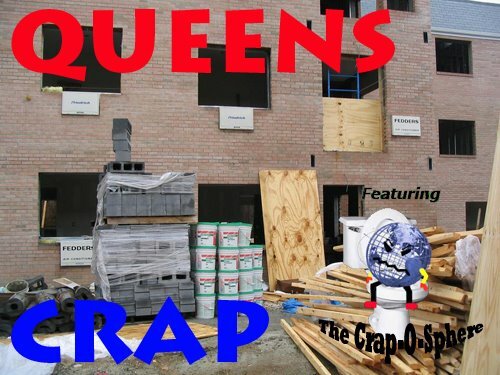 In a duplex in Jamaica, Queens, two families are still enduring damage from Hurricane Sandy. "It's horrible no one should have to live like this," said renter Natasha Francis. "I feel like the hurricane is in my home." Her building's second floor, which had been leaking since the storm hit on October 29, finally collapsed after Friday's rain and wind. Francis was left with soggy floors, ruined furniture, mold in a daughter's bedroom and constant scrubbing with bleach with little result. The landlord told her he cannot afford to make repairs. "I'm upset. I'm angry, because I've spoken to my landlord about this and now it's gotten so worse and now it's unliveable. I can't live here with my kids," Francis said. Downstairs, Khaleeda Khan's family said they fear they will soon see damages. By Saturday night, their ceiling was cracking above the Christmas tree, so the decorations were coming down. "It's not the Christmas I imagined," Khan said. "I did all my shopping, all the preparations to have a good Christmas for my kids, my family and we're not going to have it." 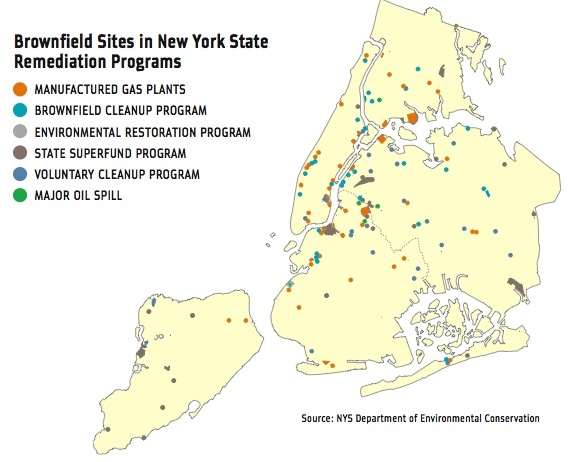 For more than a month, the Environmental Protection Agency has said Hurricane Sandy did not cause significant problems at any of the 247 Superfund toxic-waste sites it’s monitoring in New York and New Jersey. But in many cases, no actual tests of soil or water — just visual inspections — are being conducted. The EPA conducted a few tests right after the storm, but a spokesman couldn’t provide details or locations of any recent testing when asked last week. The 1980 Superfund law gave the EPA the power to order cleanups of abandoned, spilled and illegally dumped hazardous wastes, such as the Gowanus Canal in Brooklyn. “The EPA and the state of New Jersey have not done due diligence to make sure these sites have not created problems,” said Jeff Tittel, director of the Sierra Club in New Jersey. 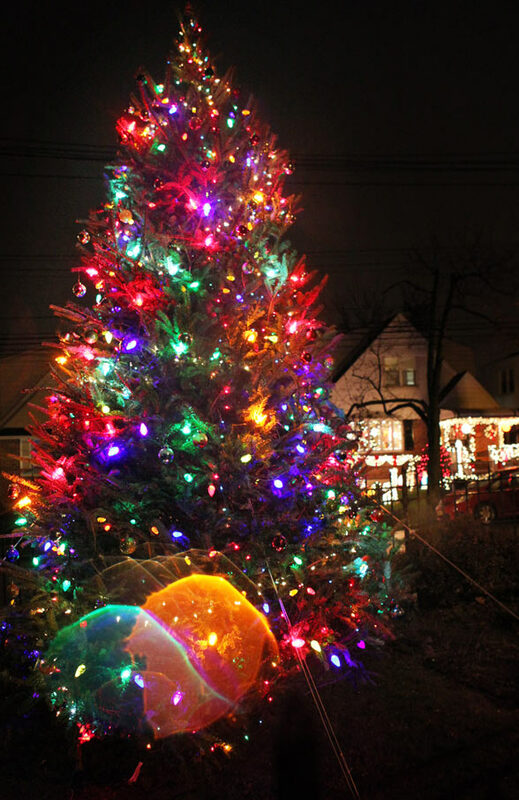 Great photo of the Poppenhusen Square Christmas Tree from the Times Ledger's Christina Santucci. For the last 17 years, Kevin Lynch has decorated his New York City home with Christmas lights. A classic game of one-upmanship with a neighbor escalated Lynch's yearly ritual into a yearly obsession, and now, well, Lynch might just have the brightest Christmas home in the City. Is NYC the cheeriest at Christmas? 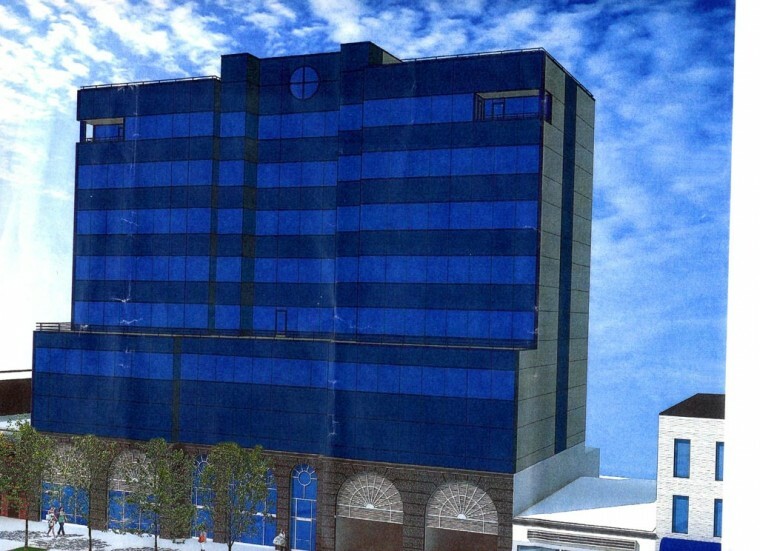 A Bayside developer was selected Monday to breathe new life into a downtown Flushing eyesore. A company called Success 88, headed by Betsy Mak, won a bidding process to develop a vacant building on 40th Road that had once housed city offices, according to the city Economic Development Corp. Mak paid $1.5 million for the property. The new building, which will replace the current one at 135-15 40th Road, is set to contain retail on the ground floor and commercial uses above. Those uses typically require parking spaces, but Mak will likely apply for a waiver to bend at least some of those regulations, according to EDC. A clause in the contract between the city and Success 88 stipulates that at least one floor of the building, or no less than 1,000 square feet, must be dedicated to space for the community. And Mak will work with the neighborhood to decide the occupant of that space, EDC said. That community space also allows Mak to tack on a maximum of 3,500 extra square feet to the structure. Space for community facilities falls into a special category of the city’s zoning laws, and including it in a building’s plans typically allows a developer to build bigger. In this case, the zoning laws would normally allow a maximum of 8,500 square feet of retail and commercial development. But because the structure will have this extra use, Mak has the option to add up to 3,500 square feet of space to house it. Problems at the Quaker Meeting House range beyond the below-ground utility pole base, reported by the Chronicle last week. Ongoing issues with a neighboring construction site include shifting borders caused by a 28-foot-deep retaining wall supported by 10 large steel I-beams. The wood and cement barrier has effectively moved 80 feet of the Meeting House’s property line back 3 feet. 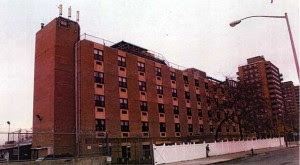 The planned apartment building at 136-33 37 Ave. has been in limbo after a stop-work order was issued following the invasion into the Quaker house’s property. The incursion also included the destruction of a previous retaining wall, with the extent of the damage at the property’s western corner still unknown. “They didn’t tell us about their plans to put this retaining wall on our property and get our permission, as they are required to do,” said Linda Shirley, member of a committee designed to address ongoing problems with the adjacent construction site. 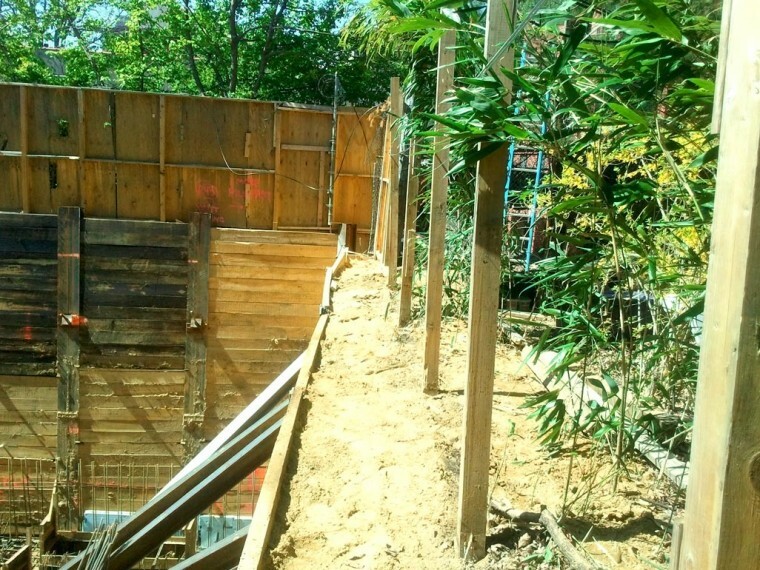 She added the retaining wall provided extra real estate to the project — on the cheap. “This was unquestionably a planned intrusion, and it’s also undeniable that they purposefully ignored our property rights and their moral responsibility to respect the cemetery and the National Historic Landmark,” she said in an email exchange. The city’s aging population, a drive for state-of-the-art facilities and strong hiring across the health care industry prompted unprecedented growth in leasing activity in the health care sector across the five boroughs in 2012. Memorial Sloan-Kettering, Mt. 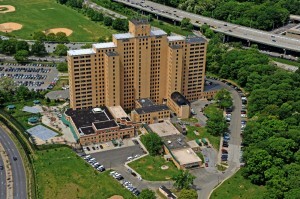 Sinai, Montefiore Hospital and Inventa Health were among the dozens of hospitals and medical companies to announce bold new initiatives to expand their footprints in the city in 2012, and those developments are only a sign of what’s to come, brokers and analysts predict. Two Flushing property owners have built multi-story buildings on a block in hopes the area will be rezoned — a multimillion-dollar gamble that received support from a neighborhood lawmaker last Thursday. That support, in the form of a letter from City Councilman Peter Koo (D-Flushing), in turn created friction between the lawmaker and the community board. A group of five property owners is seeking to rezone the block between Fowler and Avery avenues and College Point Boulevard and the Van Wyck Expressway. Regulations currently allow a variety of uses under the category of manufacturing. But the group, which collectively owns 85 percent of the block, wants the City Planning Commission to change the zoning to allow residential, commercial or a combination of both. And even though the zoning change is still being reviewed, some of the property owners have already spent millions erecting structures that would comply with new regulations. The plan was skewered by Community Board 7 last month over uncertainty of what the final product would look like and what leaders said is a lack of development experience on the part of the owners. The team received a letter of support from Koo, who hoped the rezoning would revitalize the area, near Flushing Meadows Corona Park. That did not sit well with the board. Vice Chairman Charles Apelian said Koo’s letter voids the review process, since the Council has the final vote on the matter and members typically vote along the lines of the local lawmakers’ wishes, though Koo’s office contends that giving input after the board makes up its mind is standard procedure. 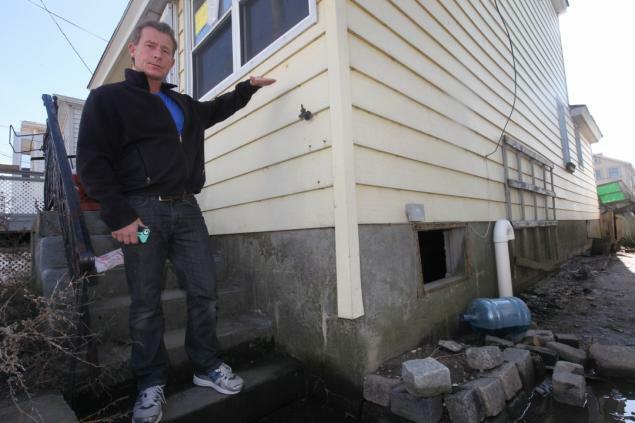 A solution for chronic flooding in southeastern Queens homes has proven to be short-lived as the state has nixed a popular ground-water pumping program. 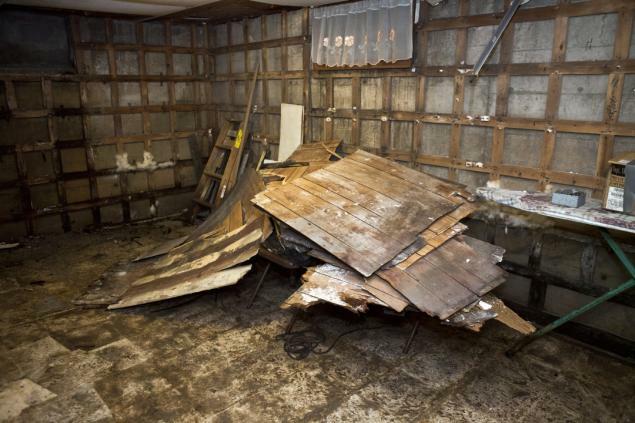 Homeowners were finally getting relief after more than a decade of having their basements flood with a mix of storm water and sewage after heavy rains. But now that the state has ceased pumping water out of a St. Albans well, which lowers the high water table in the area and alleviates flooding, homeowners are once again on edge. The well was re-opened in August to remove toxic material in the groundwater, he said. About 800,000 gallons of water were being pumped out a day until operations were suspended last month. A city Department of Environmental Protection official told the Daily News on Wednesday that the agency is not responsible for operating the wells. A state Department of Environmental Conservation official also denied having any involvement with Station 24. But a Nov. 28 email from the DEC confirms the agency was responsible for operating the well. DEC officials did not immediately respond to questions on Wednesday about whether the well would be re-opened. On December 14, Councilmember Peter F. Vallone Jr. and his staff removed more than a 1,000 pounds of garbage from Sean’s Place Playground in Astoria. An alley next to the neighborhood park has been a constant target of litterers, and some of the trash has remained there for decades. 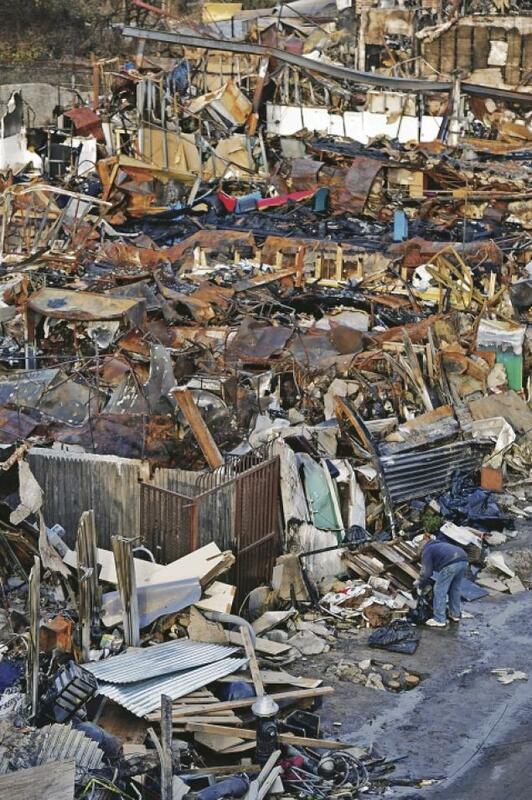 Among the debris were wooden planks with rusty nails, glass bottles and needles. Located a few blocks away from Steinway Street, the park is frequented by many neighborhood children. Previously, the area behind Sean’s Place was closed off by a fence and could not be accessed to perform a cleanup. 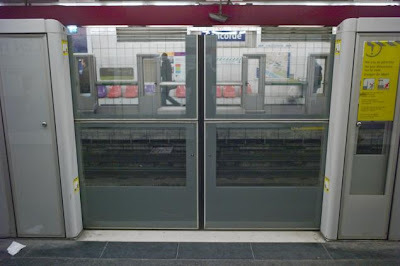 However, the Department of Transportation recently replaced the fence with a gate that could be opened and locked with a key, allowing for regular maintenance of the area. “It became a place to get rid of junk, but it isn’t anymore,”Councilman Peter Vallone Jr. (D-Astoria) said. The improvement started in April when the community organization contacted Vallone. His office led by his legislative director, Jonathan Szott, started talks with the DOT and the Parks Department. Now nearly eight months later a solution has been reached. 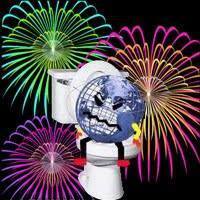 This dumping has been going on for decades. Peter Vallone, Jr. has been in office for 11 years. He only noticed the problem this past April when someone pointed it out to him. It took him eight months to get the DOT to open the gate so it could be cleaned. Pete sounds like the ideal borough president candidate, dontcha think? Like its neighbors along the Coney Island boardwalk, Oceanview Manor Home for Adults was seriously damaged after superstorm Sandy rushed in on Oct. 29. Staff reported that the home off Surf Avenue suffered major flooding and broken windows; the storm destroyed office equipment and cut power. Residents, most of whom have severe mental illness, weren’t allowed to return for a month. And after all that, the home is looking to not just rebuild, but expand. Oceanview has submitted a proposal to the city to add 24 beds to its current 176-bed residence and enlarge the building by more than 12,000 square feet, which would increase the square footage by over 33 percent. Though Oceanview’s expansion plans were submitted to the city well before Sandy hit, they could face a new kind of scrutiny, given the widespread damage to buildings along the boardwalk. Reichenthal said he didn’t yet have a strong opinion about the proposal, and would withhold judgment until Oceanview had presented its case to the community board. “One of the questions will probably be, is this the time to build more buildings while we’re still in the fog of getting rid of this? I don’t know,” Reichenthal said. It appears unlikely that Oceanview administrators have any intention of modifying the expansion plans. It submitted a required environmental statement to the Department of City Planning on Nov. 9, less than two weeks after Sandy hit. 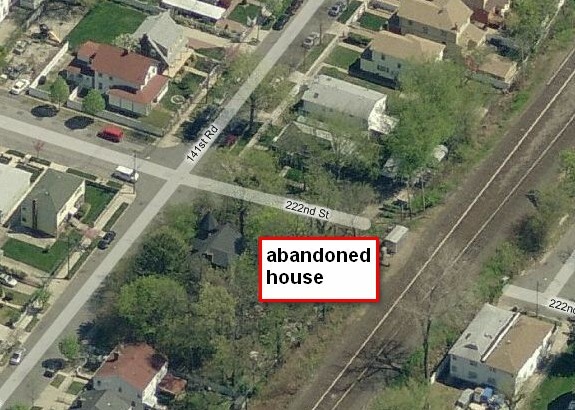 Though the plans acknowledged that the home is located within a federally designated flood hazard area, they misidentified its designation. The documents state that the home is in Hurricane Evacuation Zone B, which means residents have a moderate threat of being evacuated during a hurricane. In reality, the city’s Office of Emergency Management designates all of Coney Island as Zone A, where residents are at the highest risk of being evacuated in the event of a hurricane, and were under evacuation orders in advance of Tropical Storm Irene in 2011 as well as Sandy this year. 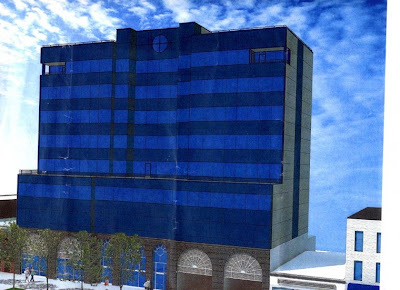 A Queens developer and a Massachusetts environmental company dumped unauthorized material onto a sprawling Whitestone site where more than 50 houses are planned at the same time they were supposed to be cleaning it under the state’s Brownfield Cleanup Program, a state agency revealed this week. The state Department of Environmental Conservation issued an order on consent, a legally enforceable violation, to Barone Management, a Whitestone-based construction and development firm, and EBI Consulting, an environmental consulting firm. The violation came after Barone Management, headed by Whitestone’s Scott Barone, and EBI were supposed to remove contaminated soil at the proposed site of 52 single-family homes, at 151-45 6th Road. They were then supposed to put clean soil in its place to ensure the ground was safe for residential use. But an investigation by DEC revealed that along with that clean soil, the companies dumped unapproved material from other construction sites around the city onto the property, according to the department. They were issued a $150,000 fine and ordered to submit a new plan on how to get the material, which has not been specifically identified, out of the site, the department said. 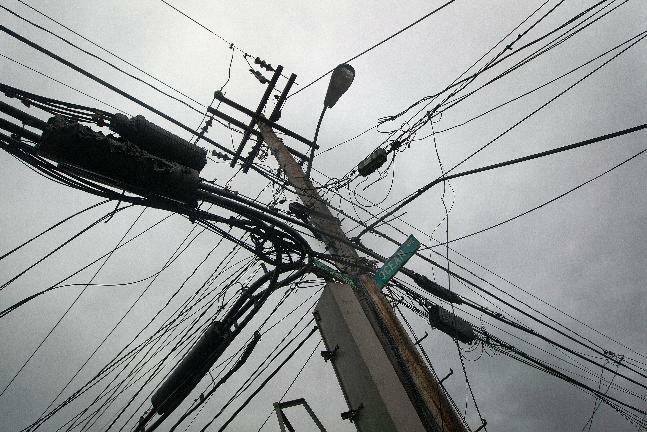 Half of the fine will be nixed when the property is clean again, according to DEC.
As the city embarks on rebuilding from the damage left behind by Hurricane Sandy, Con Edison is reportedly warming up to the idea of burying overhead utility wires into underground ducts. Residents in Middle Village, Maspeth, Woodhaven, Forest Hills and other areas of Queens which are powered by overhead lines lost power for several days following Hurricane Sandy after wires and poles were knocked down either by the wind or by fallen trees and branches that were toppled by the gusts. 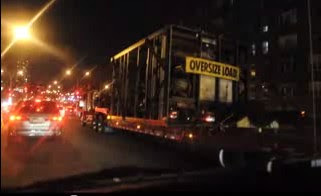 Con Edison’s announcement came last Thursday, Dec. 6, after Mayor Michael Bloomberg outlined a plan for reinforcing the city’s infrastructure during the rebuilding process to reduce the chances that the severe damages caused by Sandy will be repeated. In his speech, Bloomberg said that he would work with Gov. Andrew Cuomo on finding ways to speed up the investment of “distributed energy, micro-grids, energy storage and smart grid technologies” in order to reduce the risk and length of power outages. John Hyers, Sr., received one year of probation for his role in a scheme by Bovis Lend Lease to submit $19 million in fraudulent bills over the past decade. "In a courtroom which he literally built, I beg you to let him off as leniently as your awesome powers allow," defense lawyer Mark Baker said to Judge Allyne Ross. Hyers had pleaded guilty to conspiracy to commit wire and mail fraud — and eventually came forward with information about the scam, prompting federal prosecutors to also urge the judge to go easy on the company exec. Hyers faced more than 10 years in prison under sentencing guidelines, but will pay a mere $15,000 fine. He’s the second Bovis Lend Lease official to be charged yet receive no jail time. Last month, former Bovis executive James Abadie was also sentenced to probation and fined $175,000 for his role in the scam. Crime down, but arrests up...? Even as the prison population across the country continues to grow, New York City officials said on Thursday that they had recorded a large drop in the city’s rate of incarceration. Despite Mayor Michael Bloomberg heralding a record-low number of inmates in city jails, the amount of people arrested during his administration is the highest in city history, DNAinfo.com New York has found. In fact, the number of NYPD arrests in the Big Apple has jumped nearly 23 percent since Bloomberg took office — there were 338,788 collars in 2002 compared to 413,573 last year, police statistics show. And the number of people caught in the criminal justice system started to climb virtually from the day he took office and appointed Raymond Kelly as his police commissioner. There were 334,163 collars in 2003 — which was a scant decline from the previous year — but after that the number of arrests jumped to 351,435 in 2004 and continued to climb until it reached a peak of 422,982 arrests in 2010. So if actual crime is down, are we arresting people for no reason? I just got the following information today that I would like to share with you. 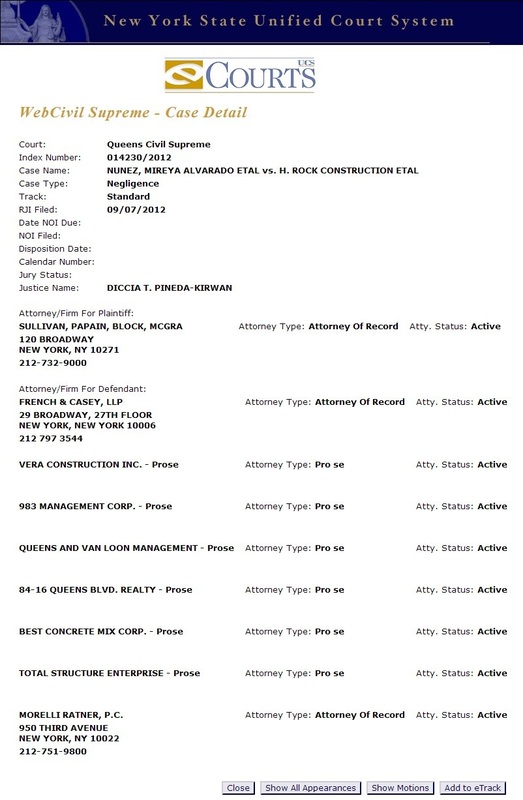 I had been waiting to see, if, and when, a lawsuit was going to be filed by the common law wife and family of the deceased and injured at Huang's Queens Blvd. site. No lawsuit was filed against the DOB or the City. And, we know that the Queens DA did not indict anyone. I was riding on the LIRR earlier this week and saw an intriguing Queen Anne house out my window that clearly had seen better days. It basically looked like a boarded up haunted house on a large lot. And this comes from Windows Live Local Bird's Eye View. There are other dying Victorians in Laurelton, a frayed patch in the southeastern hem of Queens. Yet none have the faded majesty of the two-and-three-quarter-story house that is 141-36. 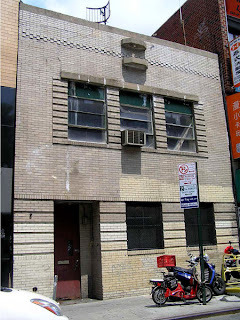 Long before the borough's arcane street, road, drive and avenue numbering began, 222nd Street was known as College Avenue, 141st Road was Lincoln Avenue, and 141-36 sat amid a scattering of large three-story homes for well-off families. 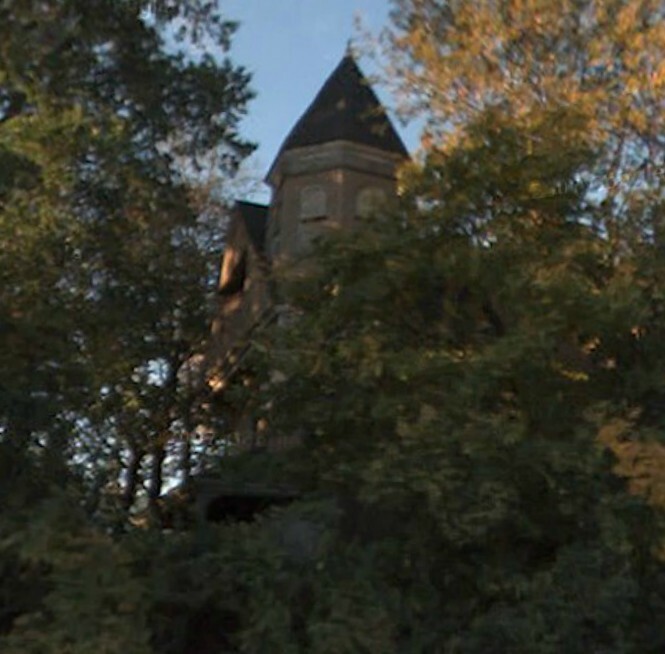 Small clues survive: Census data from 1930, which is the most recent detailed information publicly available, shows it was then the home of a family named Gross. The father, Albin, who was unemployed (it was during the Great Depression), had paid $11,000 for 141-36, and lived there with his wife, Katherine, their teenage daughter, also Katherine, and his brother, Walter, a mail carrier. A Municipal Archives tax photograph from around 1940 shows a hardly recognizable 141-36: wholesome, well maintained, a perfect example of suburban tranquility. The current condition of this house is quite sad. ...mold has become one of the biggest health hazards after Sandy. 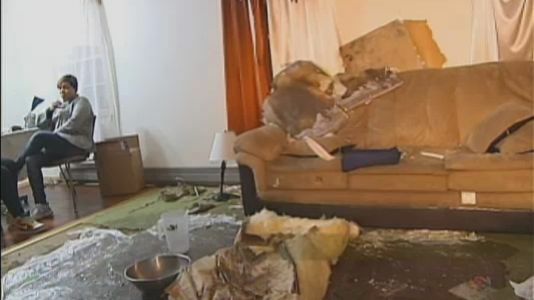 Volunteers working with the Met Council, a social service agency, found that only one in five families is hiring professional mold cleaning services, not surprising given that mold remediation can cost several thousands of dollars. The rest are either painting over the mold or purchasing cheap and ineffective cleanup kits. Until local and federal relief agencies come up with a solution, people who, like the Gonzalos, can’t afford to have the mold removed are being left to live in toxic homes. Religious leaders and elected officials are calling on Mayor Bloomberg to add mold remediation to the city’s Rapid Repairs program, which was established to help residential property owners affected by Sandy make emergency repairs including restoration of heat, power and hot water. Even worse, the mold problem is not limited to the Rockaways, says Met Council CEO Willie Rapfogel. Rep. Gregory Meeks, D-NY., failed to disclose a $40,000 loan from a real estate broker on his financial disclosure reports but there's no credible evidence that the errors were knowing or willful, the House Ethics Committee concluded Thursday. The committee declined to punish the eight-term congressman, noting that he corrected the errors and omissions in 2010, reporting the liability that should have been on his annual reports from 2007 through 2009. The decision not to discipline Meeks was similar to findings in other cases in which a House member corrected errors and omissions that were not in bad faith. The committee also said the evidence did not establish that the loan from Queens real estate broker Edul Ahmad was an impermissible gift. Meeks has contended the loan terms were in writing but has been unable to produce the loan document, saying he misplaced it. The committee found Meeks repaid the loan in June 2010 and the congressman stated the interest rate was 12.5 percent. The committee said Ahmad's lawyer contended there was no loan document signed by Meeks and no fixed interest rate. The panel added that investigators were unable to confirm this allegation because they were unable to interview Ahmad — who pleaded guilty to fraud charges in an unrelated federal case. Community advocates and local pols are criticizing the Bloomberg administration's plan to find a developer to build a luxury condo tower in a DUMBO flood zone. 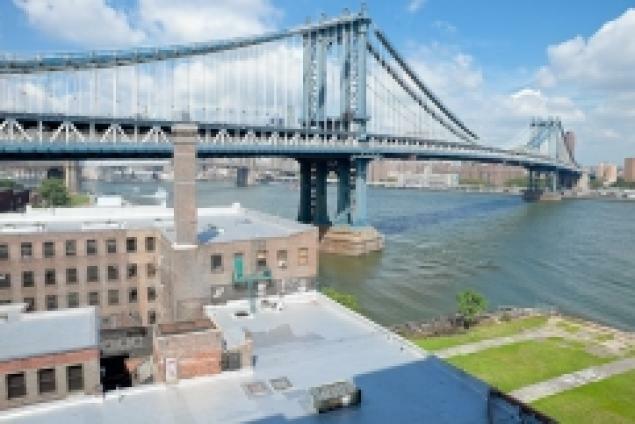 Brooklyn Bridge Park officials Monday detailed plans for a proposed 13-story complex with with retail stores on the ground floor and up to 110 parking spaces on a vacant lot on John St. just east of the Manhattan Bridge. The 130-unit building is expected to be designed with state-of-the-art flood protections, including a raised bottom level and an electric system on a top floor, park officials said. Still, the location and much of the park was buried under four feet of water by Super Storm Sandy, raising concerns about new developments. “We now know what a big bad storm can do to DUMBO and it ain't pretty,” said City Councilman Steve Levin (D-Greenpoint), who has been a frequent critic of housing in the park. “We need to re-evaluate how we build along the water and this would be a great place to start,” he added. A proposal to build a $1 billion waterfront development in Hallets Point may include a new K-8 school, according to plans presented last week at a public meeting. 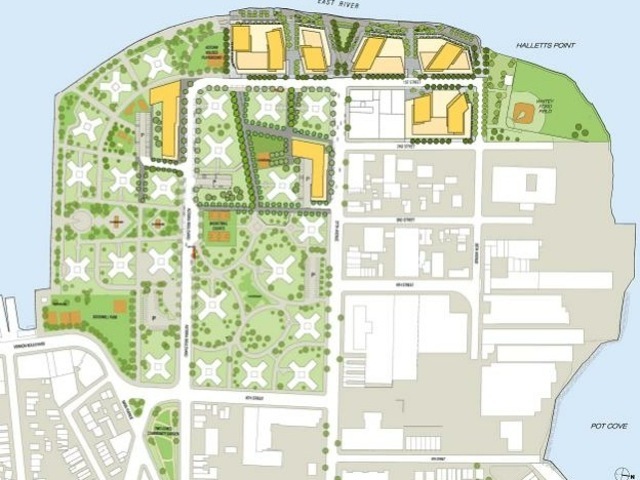 Developer Lincoln Equities Group wants to transform seven acres of the Astoria waterfront, constructing seven residential buildings with more than 2,000 apartment units, retail development and a landscaped public esplanade along the East River. The latest plans for the site now include the possibility of a new school, according to an environmental planning consultant working on behalf of the developers. The school might be necessary to accommodate the influx of families expected to move into the area once the development opens, planners said. "Having done some preliminary analysis of what this project means, in terms of new demands on the various services, we are also studying the potential for a new K-8 public school," said Linh Do, of the consulting firm AKRF. "At this point, we are thinking it will be located on the NYCHA campus." Lincoln Equities is working with NYCHA and the city's School Construction Authority to see if a school would be viable on land that now serves as parking spaces for residents at the Astoria Houses, Do said. Some NYCHA residents present at last week's meeting say they're thrilled to hear a school is being considered for Hallets Point. The closest public elementary school at the moment is P.S. 117, which is over capacity, enrolling 207 more students last year than designed, according to DOE statistics. "We want to ensure that the school is a mandate," said Ronnie Minor, who identified himself as a community activist. "The school has to be built." Andre Stith, a lifelong Astoria Houses resident who works with the local nonprofit Zone 126, said a new school would bring more educational opportunities to the neighborhood's children. "Right now we have a situation where our children are getting into a lot of things, and it’s as simple as they have no options," he said. And how does this change the game for electeds? City Councilman Peter Vallone Jr., who has been on the fence about the Hallets Point proposal, said the inclusion of a school in the plan is a step in the right direction. "That's something that I've been asking for, and I'm glad that they're seriously considering it," he said. His main concern with the project is that the neighborhood doesn't have the existing resources to accommodate the number of residents the new development would bring. 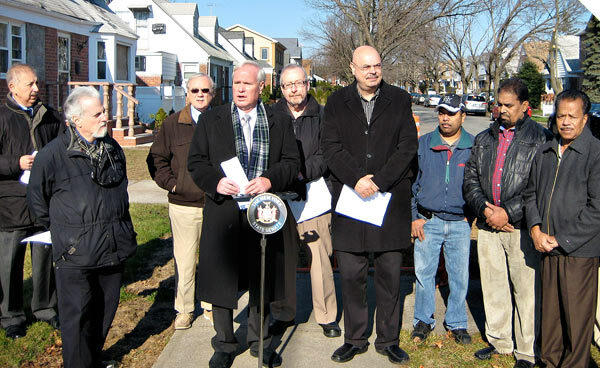 "Schools for the children there is one of my concerns," Vallone said. Vallone and other neighborhood stakeholders also worry about transportation, with several calling for a ferry service to Manhattan to be included in the plans. What about the flooding, stupid? Christine C. Quinn, the City Council speaker, said on Wednesday that she would amend a proposed change to campaign finance laws that spurred concerns about a flood of unregulated spending by unions and advocacy groups in New York City’s coming elections. Ms. Quinn’s office delayed a hearing on the bill and went into negotiations with the parties involved. The compromise, unveiled on Wednesday, involves a watered-down bill and a pledge by the Campaign Finance Board to clarify its original ruling — the root of the uproar — to “allay these concerns” expressed by advocacy groups. The new legislation is still expected to have an effect on campaign finance law. According to Ms. Quinn’s office, the bill would ensure that political communications among the members of advocacy groups would not have to be disclosed to the Campaign Finance Board. The resolution allows Ms. Quinn to claim a victory for the unions that had pushed for the legislation, groups that she is cultivating ahead of a presumed mayoral run next year. And by excising the more controversial parts of the bill, her office also addressed concerns from some critics about a potential breach of the city’s campaign finance system. And eventually over the Kosciuszko Bridge to Brooklyn. Take our soccer stadium - Please!